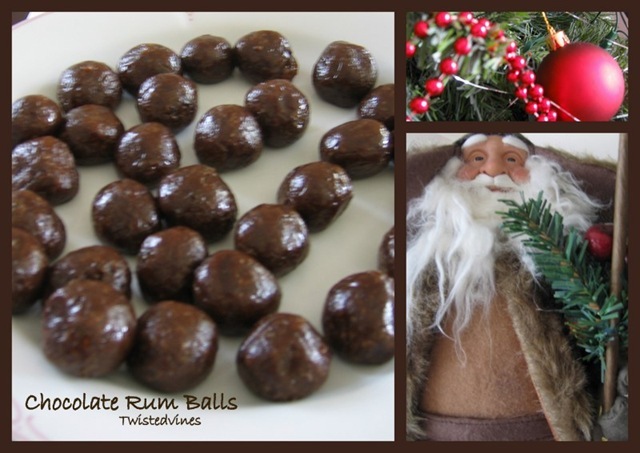 Sugar and spice make these Chocolate Rum Balls a decadent ultimate Christmas treat. Aromatic spices of cinnamon and mixed spice, rolled in chocolate sprinkles and coconut. One bite size of pure bliss. During Module 1 of The Art and Business of Surface Design course, we created moodboards and colourboards that we shared with all the other participants. It was four weeks of creative works and wonderful new friendships and energy, and I look forward to modules 2 and 3 in 2012. 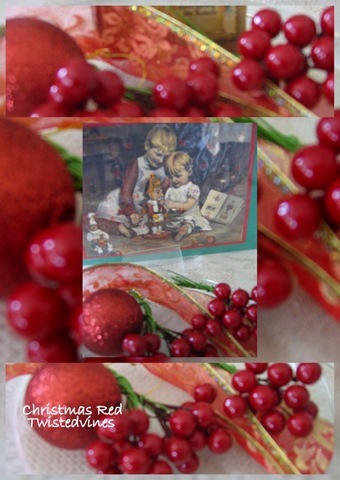 One of my boards I created was chocolate brown and red, and it’s somehow has influenced also this post. 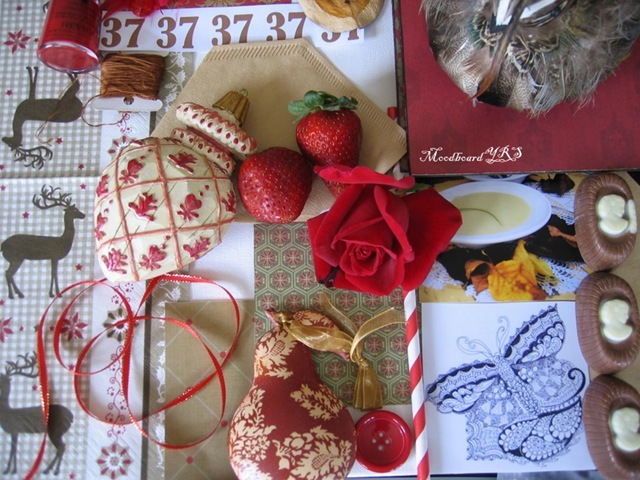 Just a little romantic touch also in my moodboard! 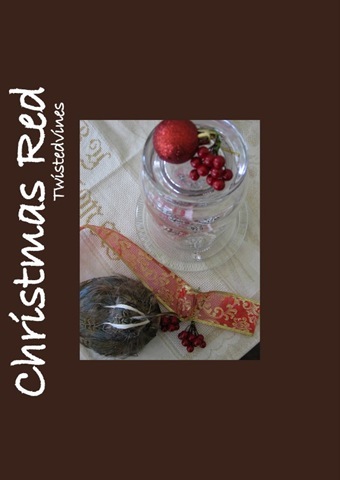 Read on for this delicious recipe for Chocolate Rum Balls and a little more festive red and chocolate brown. 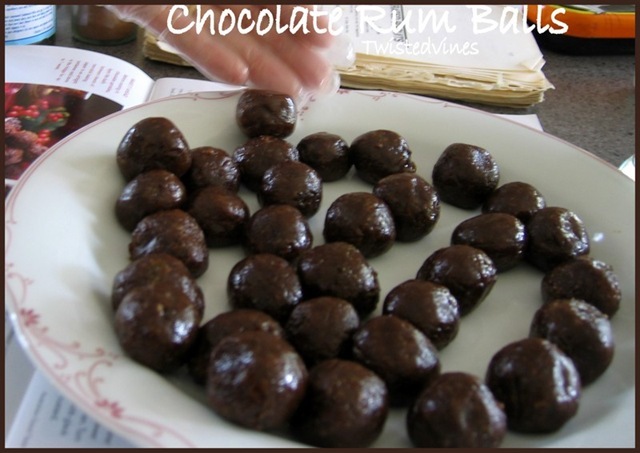 These Chocolate Rum Balls can be individually served in mini decorative patty pan cases or made into a tower. 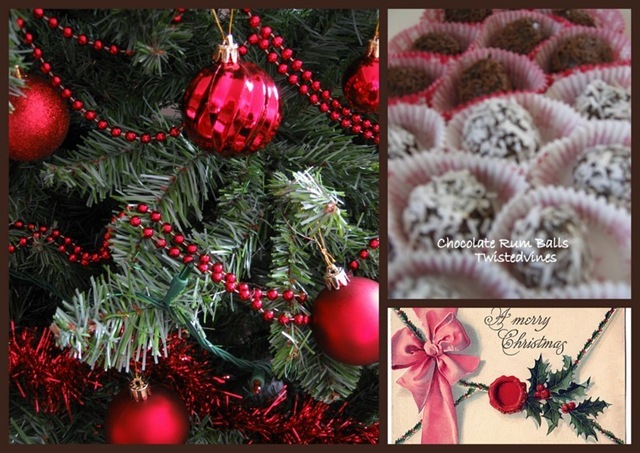 I coated the rum balls in both chocolate sprinkles and coconut. Combine the raisins, rum, mixed spice and cinnamon in a saucepan and place on low heat. Cook, stirring occasionally, for five minutes or until heated through and the raisins soften. Crumble the chocolate cake with your hands into a bowl or place in a food processor. Mix in the raisin cooled mixture, coconut, choc bits and condensed milk and stir until well combined. We found it easier to wear a pair of disposable kitchen gloves and then just get messy with the mixture. Prepare a tray with non-stick baking paper, roll teaspoons size mixture into balls and leave in fridge for 1 hour or until firm. 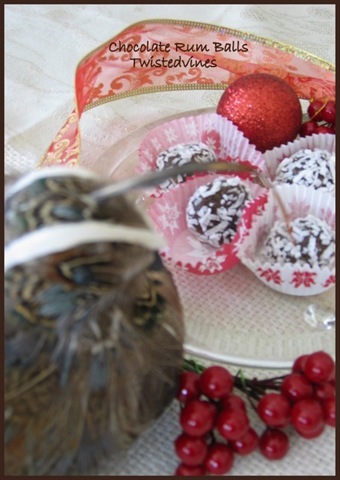 Place chocolate sprinkles and coconut in individual bowls and lightly coat each rum ball in either ingredient. Admission of over chocolate indulgence…have had a couple of these! Try these – they are easy entertaining! Oh, my! Chocolate and rum! These would be very hard to resist. Very hard! An easy entertainer! And yes agreed very hard to resist! 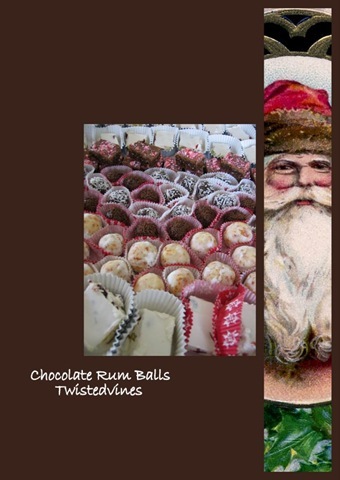 Brilliant – am making my truffles today and these will be perfect! I note the need for gloves…very wise! A must make Yvette, delicious! 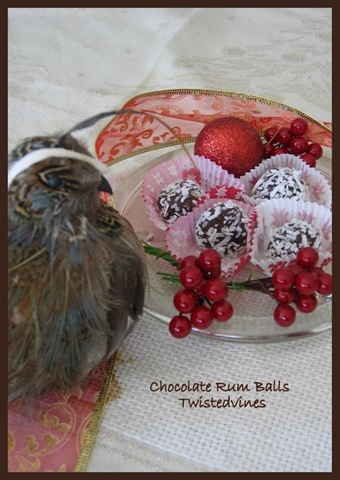 How absolutely delicious and elegant your Rum Balls look, along with all your festive seasonal touches. Your photos are just gorgeous, Yvette! These look very easy to eat 😉 Looks delish! Cheers! Not only chocolate and rum but raisins. Yum. I’m making these next year for sure. Have a Merry Christmas. They look very nice, Yvette! I bet they made wonderful Christmas presents! I am so wishing I had seen these (and several other posts) before the holidays. I’m finding so many awesome gift recipes. Hope you had a wonderful holiday! Thanks for linking up to Momtrends.com Friday Food!